Every generational upgrade requires testing in a secure environment. We can liaise with MYOB and get this established for you. 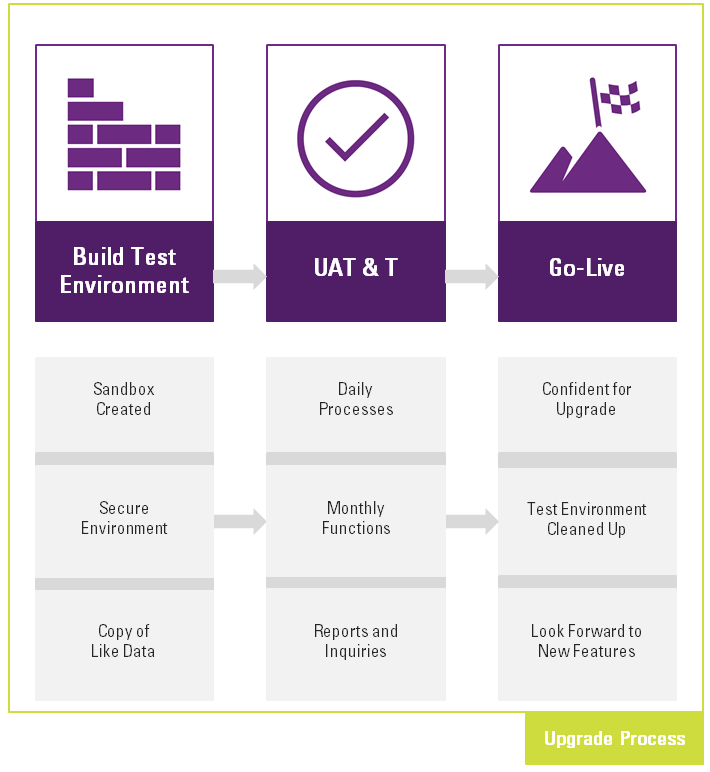 MYOB will take a copy of your live data and create a secure, stand-alone sandbox environment. In this sandbox environment, your users can run through their daily processes, monthly processes and one-off processes. If current processes are not producing the same results, these need to be identified and a resolution path developed prior to the upgrade. If users have thoroughly tested all of their functions and processes, you will be confident that the upgrade will be smooth. You can look forward to accessing the new functionality. MYOB Advanced 2017.1 is a major release that incorporates new features and product improvements to the MYOB Advanced system. We are excited to share some of the key benefits that you can expect as a result of this next-generation upgrade! Please see the two buttons at the bottom of the page to download the 2017.1 Release Notes and the 2017.1 Technical Notes. Significant improvements have been made to increase the performance of the system as part of MYOB’s continuous commitment to better the overall customer experience in MYOB Advanced. These improvements range from data upload, data entry, and data processing screens to reports. “Under-the hood” changes have been made to the underlying database structure, ensuring that customers can focus on business growth and be assured that MYOB Advanced can provide a robust and reliable platform to support that growth. Data manipulation using Pivot Table within MYOB Advanced. Productive detail analysis using improved navigation features in Generic Inquiry to quickly drill down into source transactions. If the data is in MYOB Advanced, every member of the organisation with the proper security roles can access it. Embedded Microsoft Power BI allows for BI reporting within MYOB Advanced without having the need to switch to the Power BI application. Significant development has been made in the area of dashboards which makes them more intuitive and easier than ever to configure and operate. Users now have the ability to personalise their own trending charts and tables, widgets, and alerts by simply dragging and dropping it onto their own dashboards. Have you ever wished that there is a quick and easy way to synchronise contacts, tasks, appointments and emails between Microsoft Outlook and MYOB Advanced? This is now possible with the integration to Microsoft Exchange and Office 365. Do you need better control in managing costs and ensuring that those expense policies are met? It is now possible to have approval workflow defined against supplier invoices and expense receipts. This flexibility allows for greater business agility and provides a platform that can support the growth of your team as your business grows. In addition to the enhancements and exciting new features being released, a significant number of underlying technical changes and API improvements have been made to ensure MYOB Advanced is running more smoothly and that future releases are able to be deployed with little to no effect on customisations and add-ons. The framework changes required to deliver on this future goal may affect your existing setup and it is recommended that your system is tested thoroughly before the upgrade. This is to ensure there will be no major interruption to your business when it comes to the actual roll out to your production site. Prior to the scheduled upgrade, you will be given access to a sandbox environment. The sandbox environment essentially is a copy of your existing database that has been upgraded to version 2017.1. You are strongly advised to perform testing in this environment and confirm that the usual functionalities and reports are operating as expected. Please note if current processes are not producing the same results, they need to be identified and the Kilimanjaro Advanced team will work with you to develop an upgrade strategy. List all your daily, monthly, and other period end tasks. 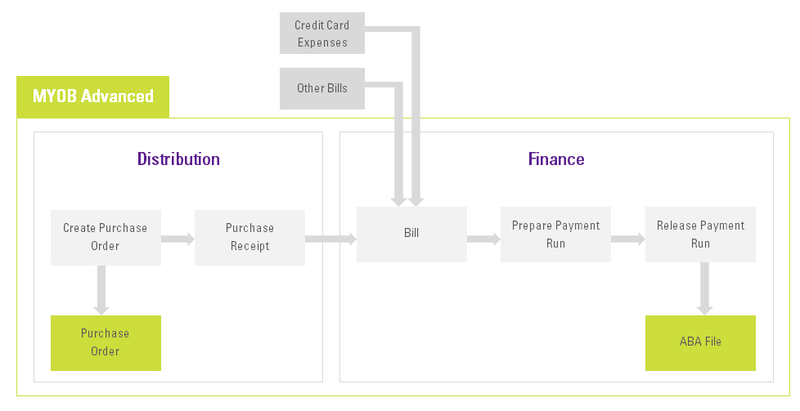 It is critical that all processes and outputs are tested from end-to-end, meaning from the beginning of the processing cycle to the end.Using the basic purchasing cycle as an example, each stage – from creating the purchase order to generating the ABA file and uploading the ABA file to your internet banking portal will need to be tested. If there is a significant change on how the system is behaving, report it immediately to us so we can investigate further and address it before the upgrade. If you would like to upgrade to the latest version of MYOB Advanced, please get in touch with us by filling in the form below, calling us on 1300 857 464 or by sending us an email at [email protected].